A few days ago I stopped by Nat Sherman on 42nd street to pick up an Arturo Fuente Don Carlos Eye of the Shark, which recently won Cigar Aficionado’s #1 Cigar of 2017. I should have known I wouldn’t find any since they likely sold out quickly in the #1 Cigar of the Year media and consumer frenzy. So I decided to pick up a few sticks of one of my old standbys, the Don Carlos Double Robusto. It’s an impressive cigar from an impressive company, and I was surprised when I realized I hadn’t reviewed it yet. Pre light draw is moderately loose, with lots of earth, spice, and natural tobacco notes. The dark outer wrapper is just a little bit toothy, with a slight oily sheen. I really dig the branding on this cigar. The combo of gold, black, white and red, combined with the raised lettering, really evokes feelings of exclusivity and luxury. This is all the better as this cigar costs roughly $10/piece. 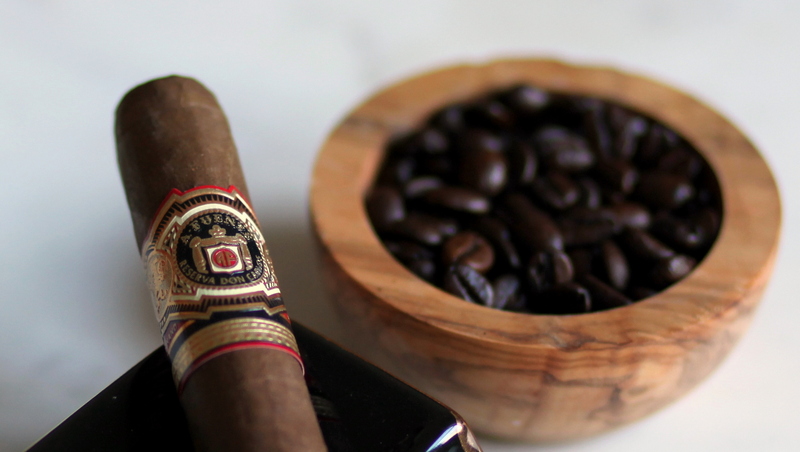 The Arturo Fuente Don Carlos Double Robusto opens with mild to medium bodied smoke featuring salty, vegetable like flavors up front and creamy coffee notes in the aroma. Certainly a uniquely Fuente flavor profile in my experience. The cigar produces a lot of smoke, and by an inch in, the salt and pepper ash is holding strong. As the cigar enters the second third, a sweetness builds that is really nice, balancing out the salty vegetal notes. I’m really impressed at how the flavors are so clear and distinct, even as it morphs and changes. At halfway, the spiciness, which up to this point has been an undertone, becomes more dominant. Construction is pretty much perfect, and the temperature of the smoke has remained cool. In the final third, the sweetness draws back and the spice and vegetal notes come back into prominence. This I’m not too excited by because I was really loving the sweet, creamy profile in the second third. I really enjoy the Arturo Fuente Don Carlos Double Robusto. It offers a profile that is very unique in today’s pepper/cocoa dominated cigar market, and I imagine it would have been just as unique twenty years ago as well. 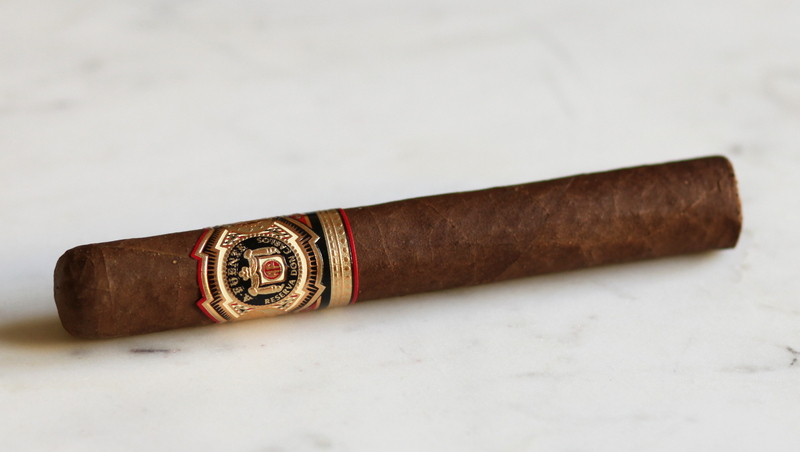 For anyone new or well into their cigar smoking hobby, the Fuente Don Carlos Double Robusto is a strong buy. You didn’t pick up any orange juice flavors? Every Don Carlos tastes like OJ. That definitely hasn’t been my experience with Don Carlos, though I can see where you get that from. There’s definitely a citric element going on in this (and other) Fuente cigars.